Tuesday, January 29, 2019: HHS will host a Virtual Listening Session from 1:00–3:00 p.m. (ET). All are welcome to join this online listening session. Registration is required. Click here to register now. Friday, February 22, 2019: There will be an In-person Listening Session at HHS from 11:00 a.m.–1:00 p.m. (ET) in Room 800 of the Hubert H. Humphrey Building, 200 Independence Avenue, SW, Washington, DC, 20201. Registration is required. RSVP by Thursday, February 14 by sending your name, title, and organization to HepHIVStrategies@hhs.gov. 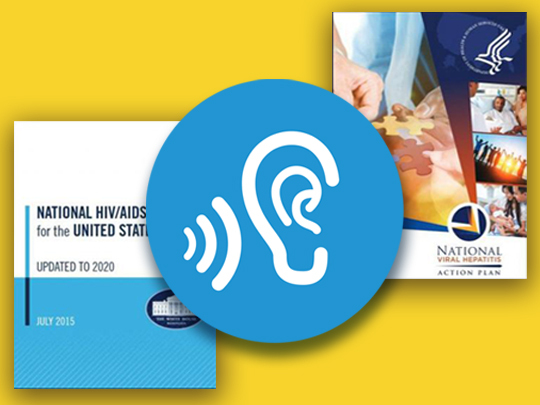 For more information about the listening sessions and developing the next national strategies for HIV and viral hepatitis see last week's HIV.gov blog or the HHS viral hepatitis blog.